Multiple weather warnings were issued Friday as a powerful winter storm moved ashore in San Diego. The storm system was expected to last through the night and into Saturday. As of 8 p.m., strong winds were felt from Oceanside to the U.S.-Mexico border and there were warnings of high surf and the potential for flooding in several areas. Heavy rain continues to barrage most of the county as well. Just before 6 p.m. the National Weather Service issued a Flood Advisory, saying rain "will increase early this evening to over a half an inch per hour. This heavy rain will likely cause urban and small stream flooding in the advisory area." The advisory covers most of the county and expires at 10:45 p.m.
A severe thunderstorm warning issued for western San Diego County that was in effect until 6:45 p.m., said doppler radar indicated a line of "severe thunderstorms capable of producing damaging winds in excess of 60 mph." More flooded areas include the 2700 block of Hollister, Avalon Court at Mission Blvd., Kingston Court at Mission Blvd, the 5600 block of Kemper Street, Dawes Street at Pacific Beach Dr. and Avenida Del Rio at Fashion Valley Mall. Ivy Dell Road in Escondido is also closed due to flooding. El Camino Real is closed between Rancho Del Madison and Sun Valley Road due to a tree blocking both lanes. The Department of Environmental Health has issued a General Advisory for the coastal waters of San Diego County due to the rainfall. Swimmers, surfers and others are warned that urban runoff that goes into ocean and bay waters, especially near storm drains, creeks, rivers, and lagoon outlets may have high levels of bacteria. The winds and rain are causing damage and power outages across the county. 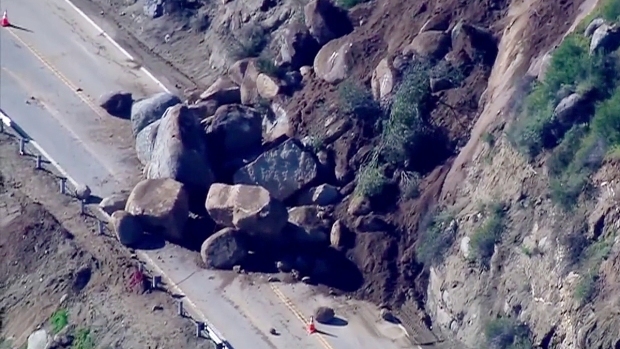 Two fatalities have been reported. One person was killed in a multiple vehicle crash on southbound I-15 at Mira Mesa Blvd. Another person was killed in a two-car crash on northbound I-15 just north of the 805. NBC 7's Artie Ojeda is standing, barely, atop Mount Soledad where winds peaked Thursday at 38 mph. Huffstatler Street in Rainbow is closed due to flooding. All lanes of northbound State Route 163 south of Robinson Avenue were closed to downed trees. A Sig Alert was issued after one of the trees hit a car causing an accident, according to Caltrans. There were no injuries reported. NBC 7's Dave Summers has an up close look at just how close the trees were to seriously injuring a driver. Caltrans announced that northbound lanes were reopened at around 7:45 p.m.
A tree also fell into a home in La Jolla at La Jolla Mesa Drive and Muirlands Drive. It was unknown if there were any injuries. Another downed tree blocked the northbound lanes in the 4600 block of Bancroft in La Mesa. Bancroft will be closed between Golondrina and Edgewood for the next few hours. Three telephone poles are down in the 3300 block of N. Mountain View Drive in Normal Heights. As of 7:45 p.m., 540 residents were without power, according to SDG&E. Power was restored in Pacific Beach by 9:30 p.m. after a power line was knocked down on the 4600 block of Dawes Street just before 5 p.m. If you listen closely, you can hear the hum of electricity as the live power line sparks. NBC 7's Megan Tevrizian is on Dawes Street in Pacific Beach with more information. A 60-foot tree fell on a duplex in Scripps Ranch, crashing into a little boy’s bedroom, according to San Diego police. Two kids were in the home at the time. There were no reported injuries. The duplex is in the 10000 block of Camto Rio Branco. The tenants of the home said that the portion of the roof destroyed by the tree covers a child's bedroom. NBC 7's Gaby Rodriguez has more. An underground gas line was ruptured by a falling tree at the Pacific Pines Apartment Complex in the 1700 block of South El Camino Real Encinitas near Manchester Avenue, according to Encinitas Fire. SDG&E crews have capped the gas leak and are working to clean up the tree and debris. Officials say that the residents of more than 100 units will be without gas through the night. Residents at the Pacific Pines apartment complex will be without hot water for the rest of the night while SDG&E works to fix the leak. NBC 7's Steven Luke has more. In Rancho Santa Fe, El Secreto is closed between Avienda Maravillas and Cantaranas due to a downed tree, pole and power lines. More than 1,600 utility customers in the Golden Hill, Logan Heights and Mountain View area were without power as well as 1,463 customers in Ocean Beach and Point Loma. San Diego Gas & Electric (SDG&E) anticipates power will be restored between 5:30 and 6 p.m. 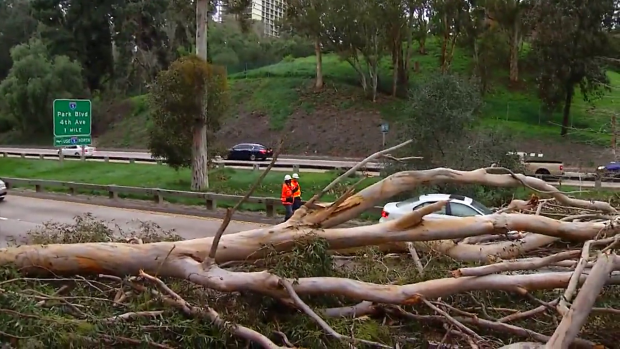 In La Jolla, California Highway Patrol officers had their hands full clearing the road after a giant eucalyptus tree fell just south of the Genesee onramp to I-5 Friday morning. The City Chula Vista closed its parks to the public to prevent anyone from being injured by falling branches or trees. At the height of the storm, around 6:30 p.m., almost all flights coming and going from Lindbergh Field were either delayed or cancelled. Southwest Airlines warned travelers they may experience delays flying in and out of San Diego International Airport due to the storm. 250 flights out of 1,300 have been cancelled statewide. Point Loma Nazarene University canceled classes Friday evening after losing power, but power has since been restored. Some faculty members at UC San Diego also released students because of the storm. The National Weather Service issued an aviation weather warning until 10 p.m. Friday, a high surf warning through 10 p.m. Sunday and a high wind warning through 2 a.m. Saturday. Gusts could reach 50 to 60 mph according to the NWS warning. “Isolated wind gust reports of 75 mph are not out of the question,” the NWS warning states. There may be tree damage, property damage or power outages because of the winds. The strongest winds were expected up until midnight Friday. The City Chula Vista closed its parks Friday afternoon to prevent anyone from being injured by falling branches or trees. Some faculty members at UC San Diego released students because of the storm. The aviation weather warning was in effect Friday for the San Diego International Airport. Sustained winds of 25 knots and wind gusts of 30 knots or greater were expected until 8 p.m.
Travelers: Winter storm may impact travel, please check flight status with airline prior to coming to the airport. Southwest Airlines announced Friday morning that the storm could disrupt the airline’s service to and from the San Diego International Airport. Southwest said flights may be delayed, diverted or cancelled during this time. Southwest said travelers with booked reservations Friday and Saturday can alter their tickets, in accordance with the airline’s accommodation procedures, without paying an additional charge. If a flight is cancelled, travelers can request a refund for the unused tickets. Southwest said travelers can check for updates on specific flights here. Other cities that may experience Southwest flight impacts due to inclement weather include: Burbank; Los Angeles; Long Beach; Oakland; Ontario; Sacramento; San Francisco; San Jose; Santa Ana/Orange County. Along the San Diego coast, surf could reach 5 to 10 feet Friday with potentially damaging surf expected Saturday afternoon through Sunday morning. Waves could reach 10 to 15 feet according to the NWS. NBC 7's Katia Lopez-Hodoyan is in Oceanside where local residents stopped by the beach before the brunt of the storm to enjoy the scenery. The highest tides will be at 2:10 a.m. Saturday and 3:25 a.m. Sunday. Not only will there be the potential for damage to piers and other structures along the coast but the waves will top jetties and other rocks. Anyone going to the coast to take a look should be aware of the potential to be swept out into the water. 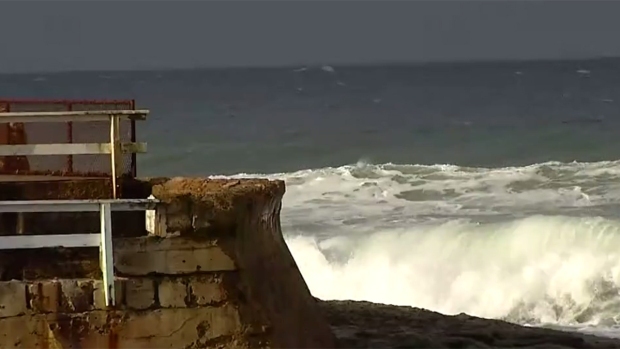 NBC 7’s Liberty Zabala tracks the storm from Ocean Beach, where strong winds and high surf began hitting the coastline Friday. A winter storm warning was also in effect for Riverside County in places like Lake Arrowhead and Big Bear Lake where visibility was expected to be reduced to a quarter mile or less Friday due to blowing snow and dense fog. Snow accumulations were expected to be 6 to 12 inches between the 6,000 and 7,000 foot elevation and 1 to 2 feet between 7000 and 8000 feet. Meanwhile, the San Diego Metropolitan Transit System (MTS) said Friday that heavy rain, flooding or storm damage could potentially impact bus and trolley operations over the weekend – plus special service planned for the Monster Jam show this weekend in downtown San Diego. MTS advised passengers to plan ahead and prepare for delays. StormRanger 7 will be driving around San Diego County today to help provide the most cutting-edge technology in our storm coverage. 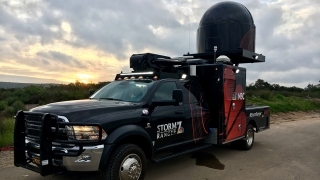 The mobile radar truck is a one-of-a-kind vehicle that has a live, high-powered radar that enables NBC 7 to get out ahead of a storm. Download the NBC 7 app for access to StormRanger 7 radar.